AS WE LOOK back on 2013 and move forward with a new year, we are once again facing change within our industry. After a number of good years of high commodity prices, we are seeing the cyclical nature of our business play out with a downturn. This is particularly evident in the corn market where an over abundant supply has resulted in lower returns. We knew that this day would come and we recognized the need to plan accordingly as we faced a reduction in government support programs. That is why Grain Farmers of Ontario has positioned itself as an organization with the ability to ensure that relevant research, market development, wheat marketing, and communication efforts are handled effectively within a very complicated market place, along with advocating for the appropriate business risk management programs. Again it is important to remember that we are in a cyclical market and high prices will once again return. 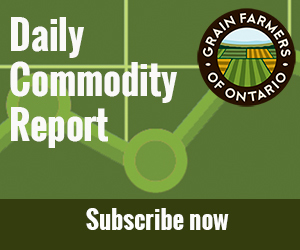 In order to support our farmer-members through challenging times, we will continue to work on value-added initiatives that maintain and increase the demand for Ontario corn, soybeans, and wheat. We are focusing on adding flour mill capacity in the province, building new soybean crush facilities, and ensuring that the transition to a marketplace without an ethanol subsidy goes smoothly. As more producers choose to convert acres to soybeans here in Ontario and across the country, we need to look at our export markets, and the trade agreements being negotiated with these countries, even more closely than we have in the past. It is important that we keep our existing customers satisfied and develop new relationships to ensure there is an increasing demand for our supply. To better foster these relationships, Grain Farmers of Ontario is involved in the development of a new national organization that includes all the value chain participants that will better reflect the growing needs of the soy industry across the country. Given the emphasis that life science companies are placing on corn production in the west, we will likely be pursuing something similar for that commodity in the future as well. Over the past year, we have addressed several significant issues on behalf of our members. We have used the full resources of our research, market development, government relations, and communications staff to ensure we are garnering the attention we need from policy makers. We are also directing those resources towards the general public. We need to assure our customers that the production methods and new technologies that we are using to produce our crops are safe. In the year ahead, there needs to be a joint effort amongst all stakeholders within the agriculture industry to combat the negative notions that are holding sway with the public – whether that be the misconceptions about gluten and wheat products or the latest ‘hormone free’ campaign at your favourite burger joint. The food we produce feeds millions of people every day – including our own families – that is why it is so disheartening to see unfounded claims take root in the general public. The other challenge is the suggestion by some to move away from a science-based approval process. There needs to be more confidence that our regulatory process through the Canadian Food Inspection Agency and Health Canada does, in fact, work very well.